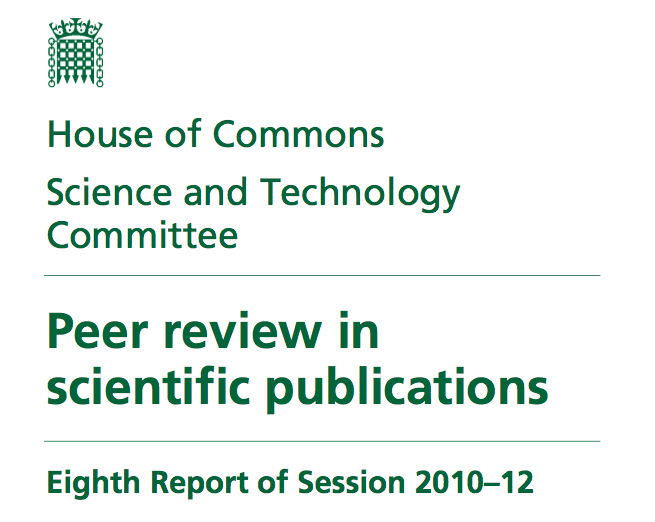 The House of Commons Science and Technology Committee has published a report on peer review in scientific publications (18 July 2011). The strengths and weaknesses of peer review as a quality control mechanism for scientists, publishers and the public. Measures to strengthen peer review. The value and use of peer reviewed science on advancing and testing scientific knowledge. The value and use of peer reviewed science in informing public debate. The extent to which peer review varies between scientific disciplines and between countries across the world. The processes by which reviewers with the requisite skills and knowledge are identified, in particular as the volume of multi-disciplinary research increases. The impact of IT and greater use of online resources on the peer review process. Possible alternatives to peer review. Peer review in scholarly publishing, in one form or another, has always been regarded as crucial to the reputation and reliability of scientific research. In recent years there have been an increasing number of reports and articles assessing the current state of peer review. We found that despite the many criticisms and the little solid evidence on the efficacy of pre-publication editorial peer review, it is considered by many as important and not something that can be dispensed with. There are, however, many ways in which current pre-publication peer-review practices can and should be improved and optimised, although we recognise that different types of peer review are suitable to different disciplines and research communities. Innovative approaches—such as the use of pre-print servers, open peer review, increased transparency and online repository-style journals—should be explored by publishers, in consultation with their journals and taking into account the requirements of their research communities. Some of these new approaches may help to reduce the necessary burden on researchers, and also help accelerate the pace of publication of research. We encourage greater recognition of the work carried out by reviewers, by both publishers and employers. All publishers need to have in place systems for recording and acknowledging the contribution of those involved in peer review. Publishers also have a responsibility to ensure that the people involved in the peer-review process are adequately trained for the role that they play. Training for editors, authors and reviewers varies across the publishing sector and across different research institutions. We encourage publishers to work together to develop standards—which could be applied across the industry—to ensure that all editors, whether staff or academic, are fully equipped for the job that they do. We consider that all early-career researchers should be given the option for training in peer review; responsibility for this lies primarily with the funders of research. We consider that it should be a fundamental aim of the peer-review process that all publications are scientifically sound. Reproducibility should be the gold standard that all peer reviewers and editors aim for when assessing whether a manuscript has supplied sufficient information to allow others to repeat and build on the experiments. As such, the presumption must be that, unless there is a strong reason otherwise, data should be fully disclosed and made publicly available. In line with this principle, data associated with all publicly funded research should, where possible, be made widely and freely available. The work of researchers who expend time and effort adding value to their data, to make it usable by others, should be acknowledged and encouraged. The growth of post-publication peer review and commentary represents an enormous opportunity for experimentation with new media and social networking tools. Online communications allow the widespread sharing of links to articles, ensuring that interesting research is spread across the world, facilitating rapid commentary and review by the global audience. They also have a valuable role to play in alerting the community to potential deficiencies and problems with published work. We encourage the prudent use of online tools for post-publication review and commentary as a means of supplementing pre- publication review. It was clear to us that the publication of peer-reviewed articles, particularly those that are published in journals with high Impact Factors, has a direct effect on the careers of researchers and the reputations of research institutions. Assessing the impact or perceived importance of research before it is published requires subjective judgement. We therefore have concerns about the use of journal Impact Factor as a proxy measure for the quality of individual articles. We recommend that the Government revisit the recommendation that the UK should have an oversight body for research integrity that provides “advice and support to research employers and assurance to research funders, across all disciplines. We recommend that all UK research institutions have a specific member of staff leading on research integrity. The Report’s conclusions and recommendations can be found in Chapter 7 (pp.88-95).